Heading down Salt Springs Run toward Lake George looking for mullet. Salt Springs spits out 52 million gallons of water a day at a constant temperature of 74 degrees. 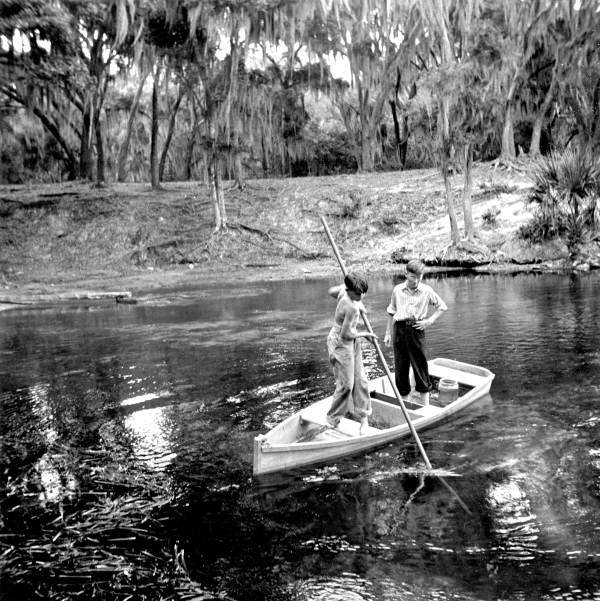 When I first saw it in the ‘50s you could drive your boat right up into the springs that are nestled in a natural limestone basin surrounded by tall oaks. The endless water, crystal clear, pours out and runs over the white bottom broken by perpetually waving grasses and flows four miles down Salt Springs Run into Lake George, the state’s second largest lake and part of the complex waterway that makes up the St. Johns River. Because the water comes up through minerals it is salty, hence the name and part of why you find blue crabs and teeming schools of mullet lazing through the grasses. The land entrance to Salt Springs used to be a little sand road that turned in by a juke joint on SR19. Some called it a general store but to us it was always the Juke and home of the lively if ungraceful Salt Springs Stomp. We often stopped there either driving in or out of the Springs. No matter what the day was like outside, no matter how hot or how bright, inside was like the Springs, cool and constant. The lights were low, there was long bar where you could order icy beers or cokes and big glass jars held pickled eggs. The wooden floor was empty during the day but at night, look out, there was dancing going on. Ladies sat delicately on benches around the edge and sipped "sophisticated" cocktails, not beer, and the men jockeyed around hoping for a dance or maybe more. But this is a daytime story and I need to stop wandering off. There were a bunch of ramshackle cabins you could rent around the springs. They were simple one-room places that kept out the rain but not most of the bugs. We’d bring our own camp stove and coolers and it was like camping. When we visited we launched in the Run nearby. We could swim all day if we wanted in the shallow water and even venture out over the deeper “boils,” the places where the springs came up from the underground caves and rivers where they were born. The water rushed to the surface creating the appearance of a pot boiling wildly on the stove. It could push you away and felt dangerous to be on top of so much energy forcing its way out of earth. Early in the morning I would get up with my Dad and we would get in the boat and pole it out over the boils looking for crabs. We had a special long handled net and I would try to hold the boat in place while he reached down into the waving water to catch a crab. We had a live well he dumped them into but if they fell out of the net into the boat their legs made a particular scrabbling noise and you needed to get your feet up fast. If you didn’t get crabs, you went to Mabel’s. She had a boat rental and crab business on the Run. She was right out a movie about Old Florida. She wore a big shapeless dress and was always in a good mood. She had dark curly hair and laughed a lot. The crabs were in a cage down in the water and if you hadn’t caught any you told her how many you wanted and she would dip them out and clean them while you waited. Cleaning them meant flipping them over on their backs and driving an ice pick into the point where the shell flap made a long vee. Pull that back and the whole top shell then comes off with a yank. Pull out the “fingers” (gills or lungs I’m guessing) and the guts and dump those into the water. That kept plenty of fish around her dock and we kids always tried our luck. Finally, clip off the legs and claws and you are done. I know folks up north think the claws are something special and even eat the whole crab during molting season but we only ate the bodies. They were like two fists joined by a piece of shell at the wrist. We’d put cornmeal on them and throw them in a big pot of boiling oil along with some hushpuppies. When they came out they were golden brown. Eating them was a skill all its own which I am proud to possess. Like a fist, each side had distinct divided areas we called knuckles. You had to break the shell on the knuckle line. If you did, you got a big beautiful piece of crab just hanging out. If you didn’t you got nothing but a network of shell that seemed impenetrable. Many summer afternoons ended with cooking crabs and hushpuppies and grits. Like any wonderful summer day, it felt like it would never end. But it did. 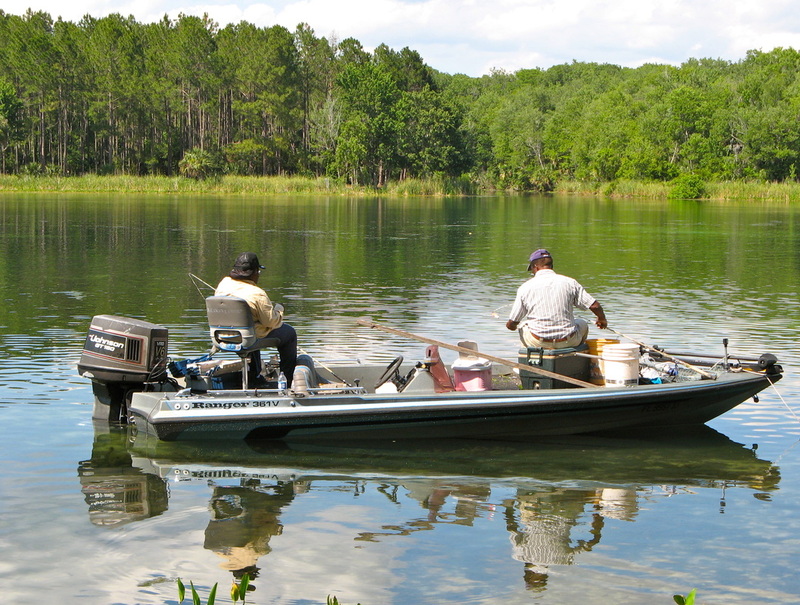 Salt Springs is now a park with camping and picnic areas and is part of the Ocala National Forest. It is still beautiful though more manicured. A ranger booth has replaced the juke and there is a big parking lot on the crest above the Springs. Broad cement paths lead down to a walkway around the water. You can still swim and there is still no lifeguard. Mullet flash their way around the shallows but boats can’t come in. A rope across the Run blocks access but just on the other side people still come in boats and hang out for the day. Just down the road a short way and in sight of the Springs is the marina where you can launch your boat. Is this where Mabel’s place was? Maybe. Regardless, the area out in front of the marina is full of people fishing for mullet. They have lines that split into multiple lines each with a tiny hook baited with a bread ball. Toss out a handful of mushed up bread from a bucket and throw your line in where the bread hits the water. The mullet come rolling through biting at that bread and if you are lucky, one of your bread balls and dinner is on the line. Kayakers paddle around the edges. Pontoon boats anchor and let the kids and dogs jump in the water. Speedboats launch and head for the lake and the mullet fishermen prowl for good spots. It’s not my memory of the Springs but it’s clear to me that the dream does live on just in a slightly different version. Salt Springs as it looks today with it's walled swimming area and well trimmed rolling grassy hills. 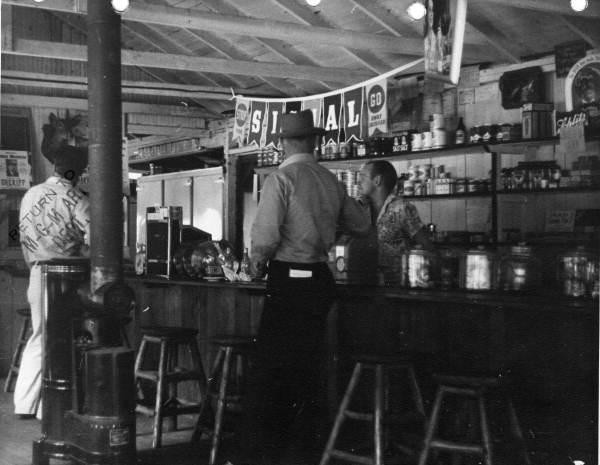 Photo courtesy State Archives of Florida — In 1939 MGM looked at the the Salt Springs general store (the Juke) as a setting for The Yearling. 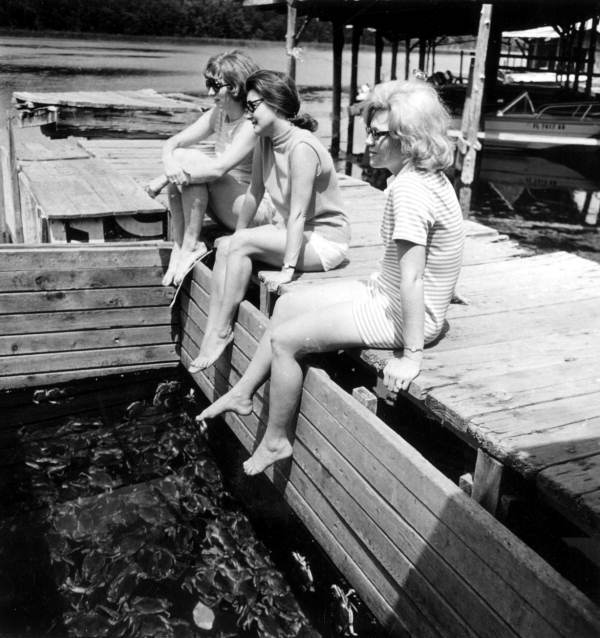 Photo courtesy State of Florida Archives — These gals are taking a chance dangling their toes so close to this pen of blue crabs in the early '60s. This couple is anchored just to the left of the boat ramp at the Salt Springs marina. They have their buckets of bread and specially rigged lines to catch mullet. © Copyright 2012: text Sue Harrison; photos Sue Harrison & Lee Brock for MyOldFlorida.com.